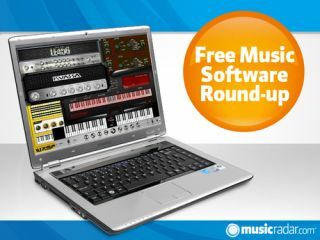 We kick off week 29 of our free music software fiesta with a virtual Mellotron, though this one's based on a slightly different model to many of its rivals. Elsewhere, electric guitarists have the opportunity to run their instruments through yet more amp sims, and if you're after an acoustic guitar simulator, we can help you out there, too. And yes, there are the obligatory new synths for you to download as well. Mellotron emulations are nothing new, but this one is based on the MKV model, which is essentially a 'double M400' (and, apparently, one of the rarest Mellotrons ever made). This third version of RedTron_MKV comes with six sound types and can also be used as a SoundFont player. Another Mothman synth from Mr Robert, who admits that its 2-oscillator design is "pretty simple". However, it benefits from three custom waveforms (diamond, 8-bit saw and woodwind), which should help to make it stand out from the crowd. The sound is reported to be "gritty yet warm and vintage sounding". The latest guitar-orientated plug-in from LePou is this preamp sim, which is said to be based on a famous piece of German gear. It has two channels (and two modes per channel), while bottom and bright switches can be used to boost the low and high frequencies. These two instruments are both sample-based, so we're guessing that the engine that powers each of them is similar. Wampire Acoustic Guitar (solo) is, unsurprisingly, an acoustic guitar module, while Waspy LE is a synth that comes with 60 presets, an arpeggiator and a filter. As a teaser for its forthcoming Amplifikation Custom guitar processing plug-in, Kuassa has released this free lite version. It's an amp that comes with three channels (clean, rhythm and lead) and nine parameters that should be familiar to guitarists everywhere.